The Holiday Season is upon us already, and we’d like to thank all our members for your generous support throughout the year. Your support has helped to fund our operating expenses and our on-the-ground bear conservation projects, such as the educational programs we deliver, free of charge, to schools and the public, our Bears & Apples program addressing local bear attractant problems. Your generosity helps support our efforts to rein in exploitative forms of wildlife tourism, and to promote ethical, low-impact wildlife travel that supports local economies and keeps the well-being of wild animals and their habitats first and foremost. Thank you for your help. As a small, grassroots organization, we work hard to keep our overhead costs low, relying heavily on volunteer work and our resourcefulness so that the majority of membership contributions goes directly into our projects. This also means that we struggle to keep our doors open, and even the smallest contribution goes a long way to help our programs. We rely heavily on our loyal members to keep our programs running. Purchase a gift membership through our website. Holiday Shopping–You can support GBF while shopping at Amazon, Patagonia, Moosejaw, or REI. If you shop through our website, those merchants will donate a portion of the proceeds to GBF. GBF merchandise makes great gifts! Visit our Cafepress store for t-shirts, bags, water bottles, and more! 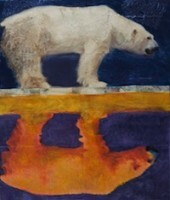 Purchase a limited edition Giclée print of Solar Bears II (pictured above), a polar bear image created exclusively for GBF by local artist, Douglas E Taylor. Douglas generously supports GBF by donating half of the sale to GBF. Earn money for GBF with internet searches and shopping online. Register at http://www.goodsearch.com/ and choose GBF as your charity. Internet searches conducted there result in donations to GBF, and you can also register to shop through them, so that online merchants will give us a portion of their profits from your purchases. Spread the word. Please help to support our projects by telling your friends about us and our field courses. You can follow the Great Bear Foundation on Facebook. and check out the Facebook Page dedicated specifically to our Churchill trips too!. Thank you, sincerely, for your ongoing support, and for helping us to ensure that bears and their habitats will persist for generations to come.